One of the most celebrated encounters in the late 1800s between the U.S. Cavalry and a band of Indians was also the last. So typical of the “Indian Wars” of the late 1800s, this one was between the army of the U.S. authorities charged with managing the settlement of the west, and a band of Indians struggling to hold onto their traditional way of life. From “time immemorial” the Nez Perce (pronounced “nez purse”) occupied a large area in the Columbia River plateau region between Idaho and Oregon. Their own name for themselves is the Niimi­ipu people. The group was first encountered by the Lewis and Clark expedition in 1805 and referred to as “Nez Perce”. This name erroneously attributed to them the practice of nose piercing (nez perce means “pierced nose” in French). It is estimated there were approximately 6,000 tribe members at that time, living in about 70 permanent villages. The traditional lands occupied by the Nez Perce included about 27,000 sq. mi. in 1805. By the 1840s and 1850s whites were being drawn to these traditional lands by the promise of free land in Oregon. And as happened everywhere across the Americas for hundreds of years, many Indian leaders resisted this encroachment. Nevertheless, throughout the entire period of white encroachment the Nez Perce remained willing to cooperate with whites. Many even willingly adopted Christianity. In 1855 the new Washington Territory was being reorganized and the Nez Perce agreed to restrict themselves to a 10,000 sq. mi. area within their former territory. In 1863, in a familiar pattern repeated across the new United States, the Nez Perce were “asked” to reduce their reservation to just 1,000 square miles in Idaho. Many Nez Perce agreed – except for one. One Nez Perce chief refused to agree to this plan because the new reservation excluded the homeland of his people. He was known as Chief Joseph and he lived in the lush Wallowa valley in northeastern Oregon where he led the Wallowa band. Upon his death his son – Young Chief Joseph – promised his father he would never agree to leaving the valley. 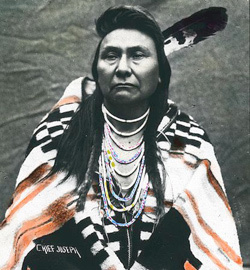 In 1877 the “non-treaty” Nez Perce people led by Young Chief Joseph were given an ultimatum to move to Idaho within 30 days or be forcibly removed. In the interest of avoiding armed conflict Young Joseph was prepared to accept, and even had the support of many of his much more militant fellow leaders. But an unfortunate outbreak of violence led to the killing of several white settlers and a number of US cavalrymen. So the “Nez Perce War” was on. Chief Joseph’s response was not to fight, but rather to pack up his entire band and set off to join Sitting Bull who was then in exile in Canada. Over the course of the next four months roughly 600 US troops pursued the fleeing Nez Perce on their 1700 mile trek to freedom in Canada. 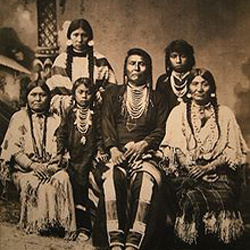 In spite of the fact that the Nez Perce group was roughly 700 strong and included about 550 women, children and elderly they managed to avoid the American troops and outfight them in several skirmishes along the way. 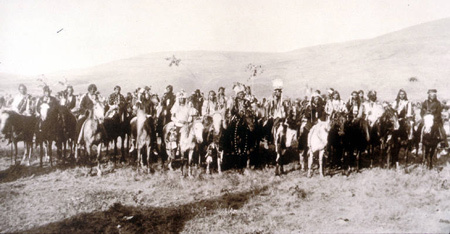 With the help of Cheyenne scouts the soldiers eventually caught the Nez Perce group just 40 miles from the Canadian border. After several key leaders were killed in the ensuing battle, Chief Joseph and the remaining leaders of the group agreed to end hostilities and settle in Idaho. Chief Joseph and his immediate followers were sent to a different reservation in Washington, and were never allowed to return to the Wallowa Valley. He died in 1904 “of a broken heart”. Chief White Bird – one of the leaders of the Nez Perce who was unwilling to accept the capitulation – led about 100 family and followers through enemy lines on the night of the agreement. They reached Canada and settled in the Pincher Creek area of what is now Alberta. In 1880, residents of the Wallowa Valley town of Silver Lake, Oregon changed the town’s name to Joseph in honor of Chief Joseph. Many other buildings, streets and points of interest in the northwest have been named after Chief Joseph, including the Chief Joseph Dam on the Columbia River in Washington. It is the 2nd largest hydro-electricity producing dam in the U.S. and the only one to be named after an American native.